Zeigler Automotive Group in Kalamazoo, Mich., has struck recruiting gold by establishing relationships with college professors who refer some of their best students for internships. A pipeline of college coaches and professors is helping Zeigler Automotive Group avoid many of the hiring challenges facing dealers. The Kalamazoo, Mich., dealership group has recruited 250 college students in the past 10 years, and 90 percent of them have moved from intern status to full-time employment. While recruiting at colleges through job fairs or placement offices is common for sizable auto retailers, Zeigler has taken a different approach by striking up relationships with professors and coaches at 16 colleges near the group's 26 dealerships in Michigan, Indiana and Illinois. By going beyond online job advertisements, Zeigler is able to tap into a talent market outside the automotive industry, said Aaron Zeigler, president of the dealership group. The strategy has improved employee turnover rates and customer satisfaction levels, he said, which helps boost sales and profitability. "We have decreased employee turnover to the single digits," Zeigler said. "Historically, especially on the sales end, turnover was much higher. ... These pipelines have helped us maintain a steady stream of people coming into the organization, and that's really helped us grow." When Zeigler took over the family business 15 years ago, it had annual sales of $180 million. That's grown to $1.3 billion estimated this year, said Zeigler, who has expanded the group through store acquisitions. Zeigler Automotive retails about 3,000 vehicles per month — around 1,500 new and 1,500 used. 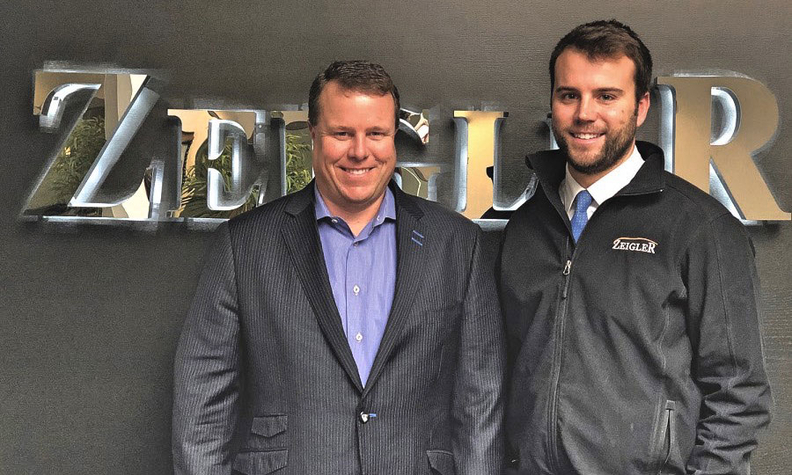 Zeigler Automotive Group in Kalamazoo, Mich., has struck recruiting gold by establishing relationships with college professors and coaches who refer some of their best students for internships. After a reference is received, company recruiters contact the student and do some checking to determine whether they possess the aptitude and talents to be successful at Zeigler. Freshman and sophomore students typically start with a summer internship and end up transitioning to full-time employment once they graduate. Zeigler works with students to determine what dealership location will best fit the new hire. For example, one student who wanted to live in a bigger city ended up at the group's Chicago stores. By determining what interns want to accomplish over time, the group can start to lay out a career with the company moving forward. "We also have an extensive development program that allows people to continuously grow in the company," Zeigler said. "Our dealership culture involves making sure these employees are excited to come to work." Zeigler offers a scholarship program that awards $100,000 annually to current employees or their children, with 10 people per year receiving $10,000 each. Former Western Michigan University quarterback Zach Terrell was hired a year ago after being introduced to Zeigler by his football coach. Zeigler told Terrell, who briefly had a free agent contract with the Baltimore Ravens in 2017, to consider working for the retailer when football was over. Zeigler's unconventional approach appealed to the student athlete. "There is nothing better than a referral," Terrell said. "That is true in our business, and that is true when it comes to recruiting." The dealership group's courtship was a striking contrast to Terrell's other job-hunting experience. "I've been to career fairs, but it's like herding cattle," he said. "It's hard to give a good impression of yourself in 10 seconds and also to get a good feel of the company you are interviewing with in that time." But during Terrell's interview with the dealership group, Zeigler went over the company's background and long-term opportunities for employees. Zeigler CFO Dan Scheid took Terrell golfing and shared with him how he successfully transitioned into the car industry with no experience. The interview finished back in Zeigler's office, where the company president mapped a 10-year plan for what Terrell's career at Zeigler could bring. Instead of starting as an intern, Terrell began as a sales associate in the showroom. Now an executive development associate, Terrell said his coach's recommendation provided an opportunity he otherwise wouldn't have had. "This recruitment process clearly helped me identify the right place of business and culture in which I wanted to work," he said. "I interviewed at numerous other businesses from all different industries, and thanks to Zeigler, I found a company that devised a plan to utilize my skills and developed a plan to see me succeed."